Shortly after I posted the spicy shrimp pasta recipe, I was able to stock up on shrimp once again thanks to a great sale at Harris Teeter. They often have the frozen easy-peel variety buy 1 get 2 free or something equally as crazy. That usually ends up making the shrimp just under $5 a pound--sometimes less. I'll gladly pay $5 not to have to devein them. I have been on the lookout for another easy recipe that doesn't involve the grill since I'm hoping fall weather is moving in. Any time I think seafood, I have to reflect back to the time we spent living on the Gulf Coast. They do things with seafood that you just don't come across here on the Atlantic coast. I must admit that I'm not a huge fan of gumbo, but we did often enjoy some of the spicier foods we tried there. One of my favorite recipe sites lately is MyRecipes.com because it catalogs all the recipes from past issues of Oxmoor magazines. Those include Cooking Light, and Southern Living among others. It didn't take me long to some across a recipe that sounded both easy and tasty, so that's how we ended up having shrimp and grits for the first time. As they say on the Gulf Coast, "First, you start with a roux..."
I did use the recipe pretty much just as it is except I didn't include the celery, and I used an 8 oz. can of tomato sauce instead of tomato paste. I also probably only used around 1 lb. 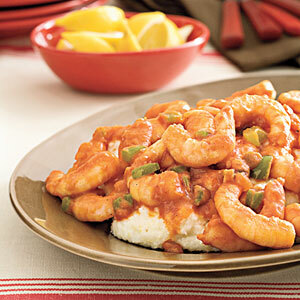 of shrimp, so I may work on creating a recipe that reduces the sauce and grits a bit. It was definitely a hit with everyone here, and I'm adding it to our regular recipe list.